We had met Lauren, Neil, and their son Spencer at the traveling families meet up in Penang Malaysia. They are Australian expats living in Chiang Mai, Thailand and they are good people! They have been making our time in Chiang Mai a whole lot of fun. They’ve been showing us around, telling us where to get good eats and how much things should cost, asking friends who live in our neighbourhood where we can buy fresh fruit, teaching us how to say things in Thai, and just generally being really rad and helpful. 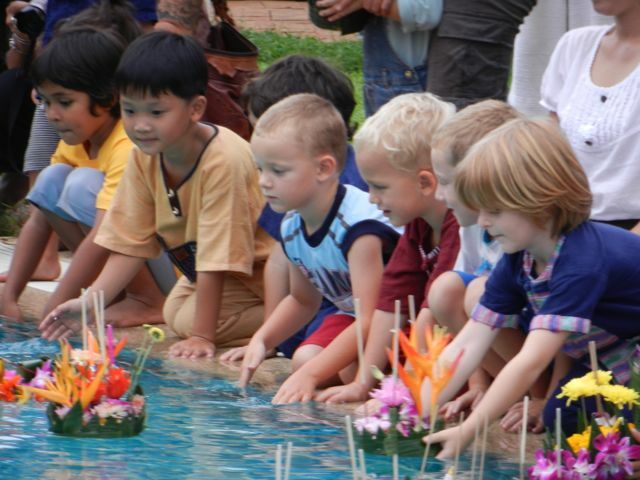 When they invited us to come and celebrate Loi Kratong with them by participating in a ceremony at Spencer’s school we jumped at the chance! 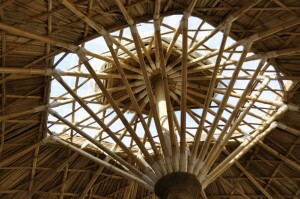 The school is called Panyaden School and it was the most visually pleasing group of buildings I have ever seen. 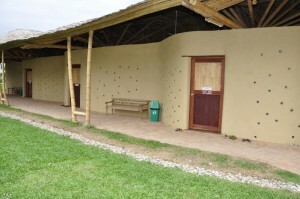 The walls are made of rammed earth, there are no straight lines, and the roofs are made of bamboo. It was absolutely gorgeous. 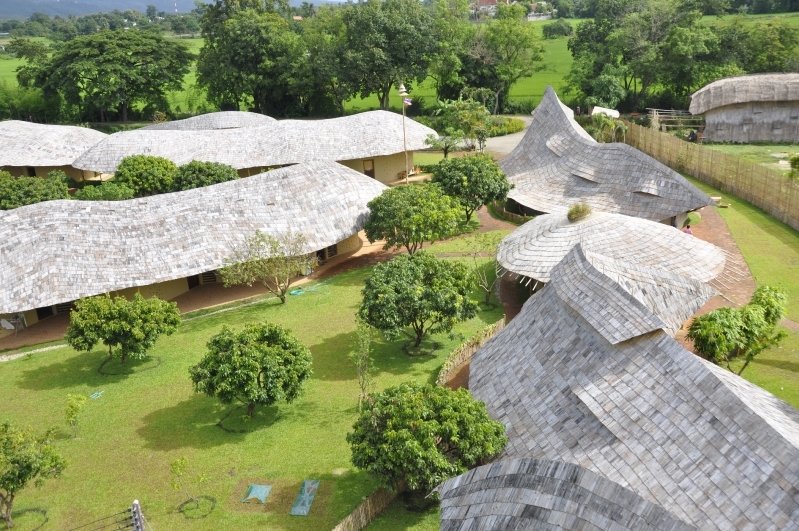 The school is bilingual, taught in English and Thai, and incorporates Buddhist philosophy and environmental awareness into their curriculum. If I were to send my children to school, it would be a school like Panyaden! 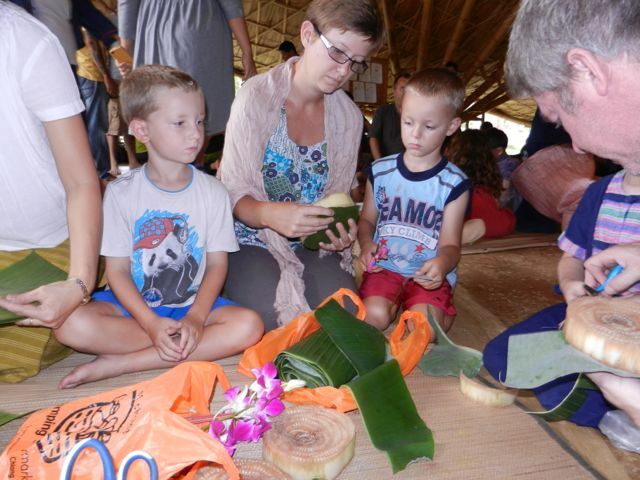 Our children were invited to partake in the days activities of making Kratongs. 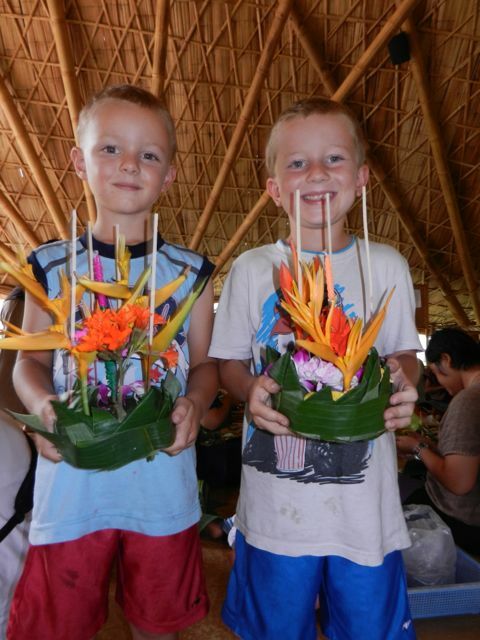 Made of banana trunks, banana leaves, flowers, incense, and candles, the Kratong is a piece of art. After everyone had finished their Kratongs we went to the swimming pool, (yes, a swimming pool at the school!) listened to a speech about the Loi Kratong festival and watched a dance performance. 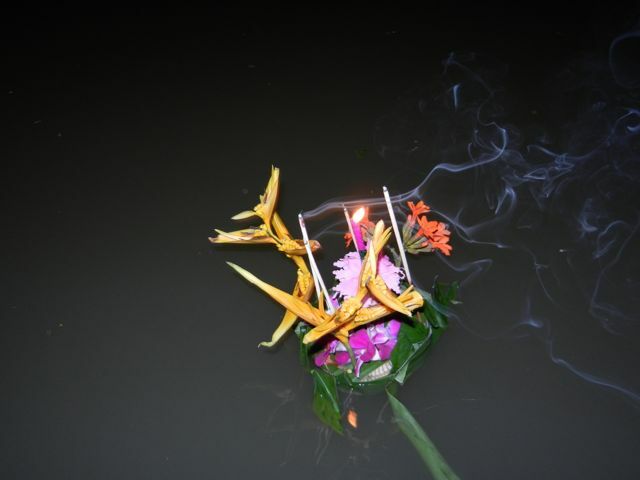 Much like the Yi Peng festival, Loi Kratong is about making a wish as you float your Kratong out to the the river. It is also about giving thanks, honouring Buddha, and honouring the rivers. We did not light our Kratrong for this ceremony though, as we got to collect them afterwards and take them home for evening celebrations. Our friends invited us to spend the evening with them and go to a local (i.e.. not touristy) launch of our lanterns in the Ping River. 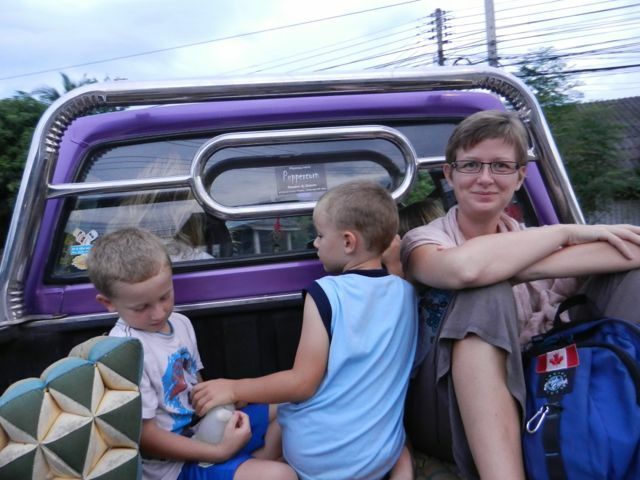 We rode Thai style in the back of a borrowed pick up truck and watched floating lanterns weave their way through the night sky and saw the sky sparkle with fireworks. 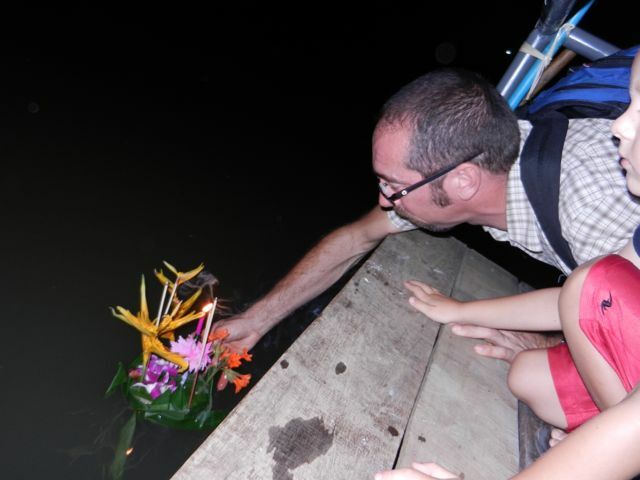 At the river we lit the candles on our Kratongs and sent them off into the river. 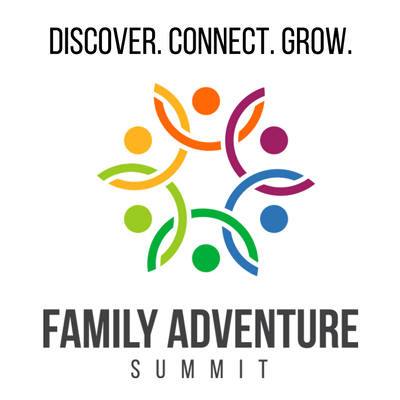 We are so thankful for the friends we have met on our journey. They are what makes our time really special. We never would have experienced such a local and off the tourist trail version of the Loi Kratong festival had it not been for Lauren and Neil’s insider knowledge and hospitality. Apparently inside the old city walls of Chiang Mai the celebration was on a much larger scale with thousands of people out and about, floating their kratongs and setting off fireworks. Some of our other friends experienced this and described it as beautiful but they wondered about how safe it was with all of the fireworks going off in crowds of people. We were quite thankful to experience a much quieter side of the festival! Hurray!!! I love that you got to do this with Spencer’s school! 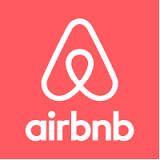 It’s a great little place, isn’t it?! Lauren and Neil are some of our favourite folks, so thankful for the time we’ve had to get to know them!! 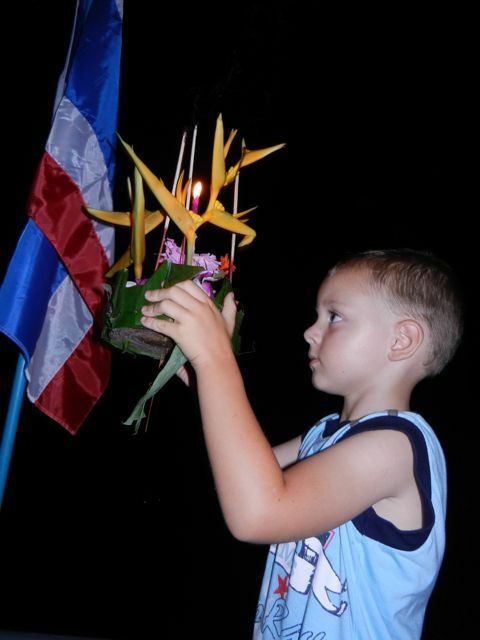 So glad you got to have a “local” experience for Loi Krathong!